Found this video via Guy Kawasaki's tweet this morning. This gentlemen eats a Bhut Jolokia pepper and video tapes himself. This might be one pepper I won't eat straight. Watched RocknRoller on my Netflix DVD two nights ago and in the previews was Body of Lies. What's interesting about this is that I watched Body of Lies and Netflix recommended RocknRoller earlier in the month. The movie studios must know how to pick them. - Netflix takes Profiles one step further and gives recommendations for multiple watchers. I know some movies I like my wife hates, it goes both ways. By taking in the ratings and who's watching there would be some great demographic data for studios and advertisers. - Netflix predictive data was licensed by retailers to help determine product layout on shelves in brick and mortar and online power the you might also want to buy. Diana and I took the day off to attend the American Apitherapy Society Conference. If you're wondering what apitherapy is? It's the medicinal use of products made by honeybees. This includes their venom as well, BVT (bee venom therapy). At the end of the first day Diana and I both partook in BVT. Diana got a test sting and I took two to the knees. In the video you can see the stinger pulsing as the venom is injected. Here's some micro stinging, which is using the same bee stinger to give multiple small stings. Each micro sting injects a fraction of just leaving the stinger in one spot to empty. Here's a video of a man getting treatment for neuropathy. We also learned some new cold treatments. "Dr. Sting" suggested eating a spoonful of comb honey and within 30 minutes your sinuses will clear out. Diana tried this and sure enough her sinuses cleared. This worked again at home this evening. Another remedy for a sore throat is to lie on your back and pour honey up your nostrils. The honey helps to kill off the cold in your nose and back of your throat. I just tried it and aside from a slight burn as it moved into my throat; my throat feels much better. I've got a lot of experience running direct response campaigns, but this banner running through Google Adsense caught me by surprise. I tried out the scroll bar to see what was up. Was the creative size wrong for the placement? Bingo, bango, I'm off to the advertiser's site. With our family cabin counter tops hitting the 30 year mark and a replacement cook top leaving a dangerous six inch gap for food and cooking utensils to fall through - it was time to replace the counter tops. We picked up some nice hardwood countertops from Ikea and proceeded to remove the old ones. We needed to cut out for the sink and stove top. I quickly found out that my father's Sears circular saw was no longer working, it was down to the basement to find another saw. Sure enough the only one there was a Stanley circular saw circa 1950. It was the saw he used to build the other house. After many years of sitting in a damp basement, it still worked. It lacked many of the standard safety features you'd find on saw today. The safety feature I particularly liked was a separate grounding wire. You were supposed to screw into the outlet center screw, luckily we were plugged into a GFI outlet. If things went really wrong I was trusting that this metal saw would trip the GFI before I got too electro-shocked. Here are two quick videos in case you want to try this at home. I had to do a few plunge cuts and use a jigsaw to cut out the corners but in the end it came out well. The only piece left to complete is the back splash. I'll use the counter cut outs and rip them with a band saw to cut them down to 3/4 inch then glue them together. The weather is finally starting to turn cold and my hives still didn't feel heavy enough for their wintering. This past weekend I picked up 50 lbs of sugar at Sam's Club and made up some heavy 2:1 syrup to feed my six hives and one nuc. From my last feeding I learned that you have to use boiling water if you plan on doing the 5 gallon pail/paint mixer power drill combo. It's the only way to ensure all the sugar dissolves -the last batch from the previous update still had small crystals in them. You'll see in the pictures below that it crystallized in the feeding trays. The hives were very active on the 8th, although it's hard to see from these pictures. There was definitely some pollen sources around as you can see the pollen on the hind legs of the bee at the top of this photo. The photo album below shows the feeders and the bees feeding. I found this video in my normal reading and thought it might be interesting if you wondered where those boxes of bees come from. No commentary from Diana in this video. Since my father is a prostate cancer survivor I thought it would be fitting for me to join the Movember movement. 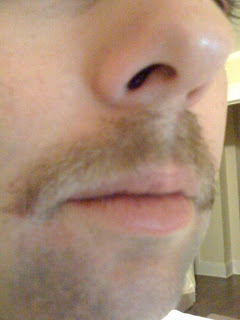 This month I'm growth a mustache to raise awareness for prostate and testicular cancer. Join me in growing your own or please donate. I'm looking forward to enjoying my mustache culture. 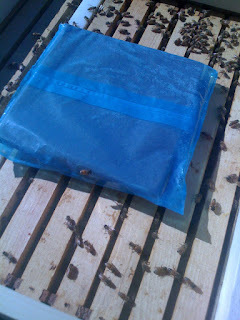 Today marked 21 days since I put the Formic Acid pads on a few of my Varroa infested hives, thus off they came. It's also starting to get cold and the hives need to be prepared for the winter. I installed the entrance reducers on all of the hives as well as put on the top feeders so I could get 2 gallons of 2:1 sugar water into the hives. It's critical to feed the bees Fumagilin-B to avoid the human equivalent of a cruise ship getting one of those stomach viruses and everyone encountering severe intestinal distress. The honey bee equivalent disease is called Nosema. Mixing up 13 gallons of sugar water (2 gallons per full hive, 1 gallon for my nuc) takes give or take 100 pounds of sugar. Normally I picked up 25 lb bags at Sam's Club, this time they were all out so it was 10 ten pound bags. Below is photo of my sugar posing with Fumagilin-B medication. Today Diana and I spent two hours watching Michael Moore's new movie, Capitalism: A Love Story. While I believe in capitalism and this film is against it, most people like me will probably write it off. DO NOT. Go see it. 1. The Political Donor class is in charge - this is the ultra wealthy who lobby government to the benefit of enriching themselves. Michael Moore cites FOA, "friends of Angelo", key political figures who got sweet loan deals from Countrywide. Special deals for special people. This is but one example and it touches some key political figures, the very people who were supposed to be watching out for the public. 2. Mortgage Fraud an insider's job - citing the FBI's 2005 report, "Based on existing investigations and mortgage fraud reporting, 80 percent of all reported fraud losses involve collaboration or collusion by industry insiders." Beyond insiders committing fraud, nobody was really looking out for the borrowers. Sure it's America, buyer beware, but be reasonable, not everyone is financially savvy. I'm sure it's possible when a loan officer is looking at a couple thousand dollar commission on a loan, he/she might not be completely level with the borrower. Next thing you know their floating rate has lead to foreclosure. 3. Obama received a lot of money from the investment houses who were bailed out or benefited from the bailout; almost a million from Goldman Sachs alone. 4. Michael Moore makes the suggestion that the reason why Americans haven't revolted against the rich is because the general public is lulled into the thought that they too can be rich some day. Maybe that's so, or maybe they don't notice the money being siphoned off slow and steady. He wants democracy to replace capitalism, I'd like to see democracy back to help change our cronyism back to capitalism. We need to put the regulations back in place that can level the playing field. Much of the great wealth in this country has been generated by men and women who have leveraged people educated by the US educational system and our infrastructure. Our system relies on taxes to fund grants and research - the same taxes many ultra-rich seek to avoid. It's fine to be successful and become rich, just make sure you are paying your fair share. At least in this country you probably won't be kidnapped or have your company nationalized, at least not right now. There are multiple colds running around the office right now, a few had taken people down for a few days. I thought I had escaped the scourge with my regular cleaning regimen. Now I'm enjoying a sore throat along with some nasal congestion and irritation. I'm treating myself with a Neti Pot , multiple packets of Emergen-C mixed in water, 10 pills of PB8 PRO-BIOTIC ACIDOPHLUS , and my secret weapon Comvita Propolis Lemon & Honey Lozenges . Bees use propolis to protect the hive and they gather it from various local plants. This mixture of resins, waxes, and other materials apparently has a natural anti-bacterial and anti-fungal properties. My first beehive has a serious infestation of Varroa mites, when I pull the screened bottom board tray I see hundreds of them. The mites are transmitting the deformed wing virus as I see the bees bouncing bees with deformed wings out of the hive. From a scale perspective, if Varroa mites attacked humans it would be like having something the size of a dinner plate attached to your back. Yesterday I applied formic acid pads for the first time to see if I can get the Varroa count down before the winter. It's relatively easy, just need to be careful since you are handling acid which is breathable and can damage your skin. I'll be back in 21 days to see how well it worked. What's interesting is that formic acid is naturally occurring in honey, just not at the sauna levels. This marks the second year the Johns Hopkins Second Decade Society has held their Interview Techniques and Etiquette Panel at the Homewood Campus. I would also recommend their new podcast series, CareerTools. Make your resume and cover letter stand out: I remember back in the late nineties waiting for my interview to begin at an investment bank in the WTC complex. Sitting in the HR department, I looked over and saw an inbox stacked with resumes, they were all folded and creased. They didn't lay flat and I'm sure were hard to photo copy as well as handle and read. I started from that point forward sending all my resumes and cover letters via USPS Priority envelopes. I took one more step and placed them inside a manila envelope with a label and the persons name on that as well. Thus when the priority envelope is thrown away you still have a great presentation of your resume. High quality resume paper is heavy, you put that in a normal envelope and it will come out with permanent creases. Most likely the HR department are your gate keepers, make life as easy as possible for them. 2. It could skip some of the normal work flows that resumes get processed through. 3. It guarantees that your resume and cover letter are delivered in a pristine format. No vagaries of whether your word doc formatted correctly. 6. Maybe the employer gets upset because it didn't come through the proper delivery format. On their website, via bits and bytes. Sure that's a concern, but you cover yourself by submitting the requested information the standard way. I've done hiring via electronic job boards at jobs past and the incremental cost for a candidate to submit a resume is low thus you get a lot of resumes many of them not qualified. People tend to take the pray and spray approach. If I had a resume show up on my desk in a priority envelope and they let me know they also submitted via the normal channels and the resume was a fit. That would stand out. Maybe others would disagree, but from my perspective it stands out. Hiring the Best: Manager's Guide to Effective Interviewing and Recruiting : I found this book back when the first edition was out and it's been useful in my hiring ever since. It's covers great behavioral questions and it's from the hiring manager's perspective. If you want to be fully prepared for tough questions that will strain you preparation, read this book and prepare answers for all of the relevant questions. Key point I'm making here is the better you know yourself the better you can represent yourself. Your about to be a Hopkins graduate, you've probably worked really hard. I know how driven most of the students were when I attended. You need to put the same level of effort into your job search. You can read a thousand different books on finding a job - the difference between the people who succeed and those who don't are the ones that actually take action. There will always be the next book on X, many people just keep buying, reading, and shelving versus actioning. Do a great job, be successful, join SDS, and present here in 10 years yourself. This was the honey harvest weekend and it was a bad season. I harvested less honey than I did last year and that was the first year for that particular hive. 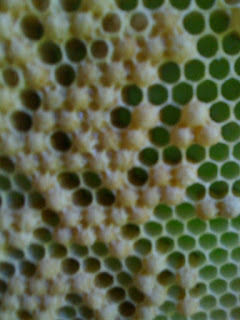 I can only hope for a big year in 2010, with six strong hives; took some pictures below of the bees cleaning out the leftover honey in the extractor. We also stopped by the annual fireman BBQ in Cedar Point Park. What an amazing spot, a public camp ground open to anyone. Definitely rediscovered the beauty here and will have to take some bike rides with Diana to explore. My mother saved this article from the NY Times for my wife, Diana. Apparently other couples have similar Vibram Five Fingers challenges. I wrote this post back on September 11th, 2006. It's still relevant as it's what I remember from that day. I mentioned in a previous post that I had setup a queen castle with four frames, each containing a few queen cells. 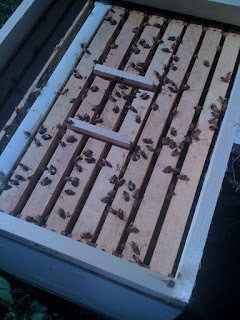 This weekend I re-examined the four compartments and sure enough there were queens and a three had eggs. QC #1: Queen was moving and there were fresh eggs in the comb. I marked her green. QC #2: Queen was moving and there were fresh eggs as well. Marked her green. QC #3: Queen was moving, but no eggs. Tried to mark her, but no luck catching her. The lack of eggs has me worried. QC #4: Queen was moving and there were fresh eggs. Marked her green. Since it looks like Queen #3 might not be a winner, I removed the divider board between 3 & 4 and I'll let the bees sort out which queen lives. Since I have one marked green and the other not, I will soon find out. Saturday I was walking around the in-laws property and noticed a lot of bees flying around a section of the privet hedge. Hmm, that's odd there are no flowers there. After closer inspection I thought I had found a swarm, but it was a hive that had formed in the hedge. This would explain why my father-in-law was chased by the bees when he was mowing. Normally bees won't come after you if you're not near their hive. He clearly was near this hive. By the look of things this hive was there for a few weeks, you can see in the pictures there was sealed brood. 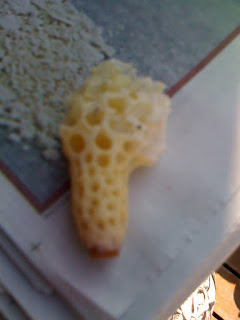 First step was to get the hive out of the bush and into a hive body. Only problem was that all of mine are in use. I had a few boxes kicking around from my father's beekeeping days. Took a bottom board and hive body, fired up the propane torch to "toast" the inside to kill any latent diseases and they were put back into service. As you can see from the pictures I don't have a proper hive top, a simple piece of plywood would have to do. I placed the wild hive in the box, hoping they'd start building out the frames. That lead me to build some bee swarm frames from plans I found on the Internet. I built six of them and then went to work on Sunday placing the comb into the frames. The wild hive was designed to hang off the bush not lay sideways. Of course another swarm showed up yesterday, thanks to some family help they are sitting in a Nuc hive right now. Perfect opportunity to try out my queen castle from Brushy Mountain. All four bays are now filled with a frame of brood and a queen cell or two along with a division feeder. Now I wait and in two-three weeks I should find four matted queen bees. I wasn't able to find the queen in hive #4 so I'm not sure if she's dead or left with a swarm. I'm not too worried as the main hive still has a few queen cells. We'll have to wait and see how this all turns out. Snapped some nice shots on Saturday of a few honey bees all over the mint in the garden along with a crazy looking caterpillar. 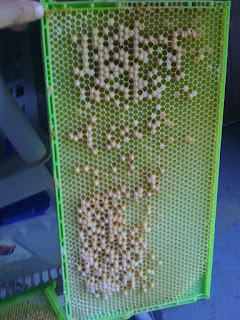 Saturday marked 21 days from when I originally put in Pierco plastic drone comb frames into three of my hives. I pulled them and sure enough the swarm hive had built them out the frames in a normal fashion. I took a few pictures before I placed them in the freezer to kill off any drone brood and Varroa mites hiding out in those cells. Notice the honey for the drone brood with the white cappings on the upper edges. I replaced these frames with new blank Pierco drone frames to be switched in another 21 days. While I was helping out with the Cole Haan gift bags, the event was rocking. There were a ton of people and everyone seemed to be having a great time. This year was bigger than last, can't imagine what next year will bring. Did get a chance to chat with Nelson DeMille, one of my favorite authors. Looking forward to the Lions Game sequel. Below are some photos, from Keri Lamparter the PR maven. Great article in WSJ.com today - "Lawmakers' Global-Warming Trip Hit Tourist Hot Spots"
Sure maybe it's stimulus money, or maybe the seats are comfortable. Why not invest in something that builds future capabilities of the country. After swimming a few laps this afternoon I lounged out for a cold Red Bridge Beer. One of my bees, to drink the pool water off my foot. What's amazing is that she came back 5 times and brought friends. Hardcover plus Kindle Version: My wife helps organize the Authors Night book fair in East Hampton. It would be great to get a signed copy of Bob Caro's book and get the electronic version to read it. A real progression indicator: How close are you to finishing based on the book, not the appendices. I recently read The First Tycoon , and the book essentially ends at the 73% mark. I could feel the book winding down, but kept seeing the percent read not making sense. Reading Stats: Word per minute, statistics on your reading consumption, your consumed word asset allocation (fiction, non-fiction, history, etc). Imagine Morningstar's X-Ray feature but applied to your reading. For some reason my blog post, How to use an air conditioner and not destroy your steel casement windows, was one of my most popular via SiteMeter. I thought it might be helpful to go into a little more detail on the Plexiglas insert I built for the Sharp CV-P10MX portable air conditioner. Below you'll see some metal twist clasps that are spaced off the Plexiglass with some metal washers. The nut is attached with Loctite Threadlocker to prevent it from loosening up with use. The Plexiglas insert is compressed by the window itself. On the left of the picture below you'll see the left of the window pressing against the Plexi and holding it in. The handle of the window is held with the eyelet bolt and tightened with a wingnut. FYI - Here's a useful link to Consumer Reports for an air conditioner sizing worksheet. I just finished reading The First Tycoon: The Epic Life of Cornelius Vanderbilt by T.J. Stiles, which was not a short read, but worth it. I was especially glad it was on my Kindle 2 , versus a 736 page hardcover to lug during my commute into Grand Central Terminal every workday. If you're a New Yorker, you need to read this book. It's amazing to read about the development of the rail roads and ferries in and around the city. If you're a reader of business biographies, you need to read this book because Cornelius was the first tycoon. While it's hard to truly compare, he's probably the richest US citizen ever. I clipped this quote from on Kindle 2 because it struck me as relevant to the Internet and housing bubbles we've just experienced. I guess we haven't learned much since Cornelius. I've read about the small hive beetle and their devastating effects on honey bee hives, but always assumed they were limited to the south. A few weeks ago I spotted a few in one of my new hives. I didn't see any of the larva, but the beetles scurried around until I smashed them with my hive tool. After researching my options, some of which included vegetable oil filled trays to trap them I found out that there are specific nematodes that attack the SHB. This morning I applied Heterorhabditis indica nematodes purchased from Southeastern Insectaries in a watering can around my hives. It'll be interesting to see if they combat the SHB life cycle. The actual nematodes come shipped in a Styrofoam cooler and they are suspended with that gel you put in flower pots to provide moisture storage. In the bag below there are about 5 million of the nematodes that specifically attack the SHB. I had some difficulty in actually counting them to make sure I wasn't ripped off. You might have an email address from college that isn't the most professional. Maybe you couldn't get the address you wanted? Maybe you just want to have your vanity address on all the email services? You wouldn't want someone to impersonate your Yahoo address on AOL? My old Yahoo account (10+ years old) is plagued with spam, lots of spam. The filter doesn't seem to work nearly as well as my Gmail or AOL account. Over the past few years I've been moving most of my friends and company registered email addresses off my Yahoo account simply for the reason I get between 4 and 10 SPAM emails a day. It's a waste of my time to clean out these unwanted emails. My iPhone is constantly dinging as get this SPAM. The other day I tried registering my normal email address on Yahoo and it was available, it was time to retire my old account. Today I took my account out back and erased it. Sure there is still some concern that I'll miss an email from someone, but with all the different social networking solutions I'm sure they'll find me again. Whether the Spammers will is a whole different story. Steve Ballmer sat down with the WSJ for some short video segments on his management style. It's worth the 10 minutes to watch them all. Managing your time - I follow a similar model of planing on a weekly basis to make sure I'm focused on the right people and issues. I haven't seen my hives in two weeks so imagine the surprise when I checked them and on my way back to the house I see a swarm in a nearby tree! Normally you reverse your hive bodies to ensure the bees think they have plenty of space and they don't swarm. I guess I missed something. 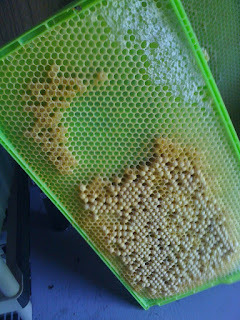 Capturing the swarm is relatively easy, just climb a ladder and shake them into the box. Then dump the box of bees into a hive.